Distance measuring devices are more popular than ever and while many devices seem to be popping up each and every year, one brand still appears to be the most discussed on the THP forums and that is Bushnell. The new Z6 device is accurate from 450 yards and has what the company calls VDT (Vivid Display Technology) and in THP testing, was one of our favorite devices in the entire category. The picture above says it all and it is the Bushnell Z6 laser rangefinder. To enter, simply explain why a Bushnell Rangefinder would help your game in the comments section below. Winner will be randomly drawn. The deadline of this contest is Friday June 29th, 2012 at 11:59pm EST. All entries must be received by then to be considered. Your comment counts as 1 entry in the “hat”. If you Tweet this contest on twitter you will also receive a bonus entry in the “hat”. You can do so by mentioning the contest & the twitter handles @hackersparadise @BushnellGolf in a tweet. If you mention this contest on Facebook by tagging the Bushnell Facebook Page & “like” THP you will also receive a bonus entry. If you are a forum member with at least 10 posts, and 5 in the last 30 days, you will receive 5 entries in the “hat” rather than 1, if you choose to enter. Good luck everybody. Winner will be announced in the THP Forum in the contests section Sunday (a week from today) evening. I’ve never had a rangefinder…I’ve never had good distances either. I like to have both. I played with someone who had one once and it helped my game. And I didn’t even use it, he just called out exact distances. Think what I could do if I actually had one. This rangefinder would do wonders for my golf game. I play golf a lot by guessing and feeling the shot, and take the marked yardages into consideration…cuz a lot of times have a tough times I have a tough time believing them. IMO, I think that over 50% of the sprinkler heads are labeled incorrectly. So to have this rangefinder for be great for me (and my course!) It would also definitely help me out when I go play other courses and don’t have a guide along with me. This is one of the toughest things when it comes to playing other courses…is knowing exactly how far it is to reach (insert hazard here). My old eyes just can not judge distance anymore, I really do need something to tell me how far I am from things on the course. The Bushnell Z6 will help my game because it would be replacing an old Bushnell Dinosaur. It’s never a bad thing to know your distances, and Bushnell is king of the Laser rangefinder business. A Bushnell Z6 would help me always know my exact yardage to the pin or to a specific target. Then it is up to me to execute the shot. A Bushnell Rangefinder would help me with getting a more accurate distance for each of my clubs as well as a gain more knowledge in deciding which club to choose for the next shot. A new Bushnell rangefinder would hep my game by confirming the distance I’m away from the flag. I often find myself guessing roughly where I am and end up guessing wrong half the time haha. It is quite common for me, especially on wedge shots, to misestimate the distance to the green, which leads to overshooting or not reaching the green. For longer shots too, knowing the exact distance will help a lot in better club selection, and even strategy. I lay up too often when I could have reached the green, and knowing the exact distance will help me to solve this problem. So, looking forward to a Bushnell Rangefinder! As I practice at the range and rely on their markers to tell me how far I hit each club, it would be nice to be able to know for myself with my own rangefinder than to have to be dependent upon other means. The Bushnell rangefinder would definitely be a huge help. It would not only help with yardages, but help save time. It takes a lot of time to find yardage markers. If you can’t find yardage markers, I end up having to guess. I would really love to have this. Thanks. I’m playing at a private country club for the first time with my cousin and the course pro. Went to download the gps mapping for the course on the gps app I use on my phone and found that the course isn’t mapped. Downloaded another gps app only to find that it wasn’t mapped for that app either. Gonna be stuck using sprinkler heads for yardages tomorrow and probably embarrassing myself in front of the course pro (though I probably would have done that anyway). Would love to be able to just point at the flag for distances. The Bushnell Z6 would be a lifesaver for situations like this. Having the rangefinder makes things easy on the course and on the range as well. We all know that those “distances” at the range they provide on the board are 90% wrong. With this rangefinder it will help me dial in better distances at the range which in turn will help me get more consistent distances on the course. 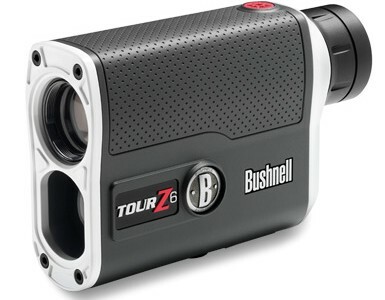 I have used a GPS but most players at my club use a rangefinder-primarily Bushnell. Some of the greens at my club are 45 to 50 yards deep so knowing the exact yardage to the pin is critical or you could be 2 clubs off on your distance. I also think a Bushnell rangefinder would make my range time more productive. Knowing the exact yardage to the pins on the range would help with distance during practice sessions. Thanks for the chance. I have played a few rounds with a GPS or rangefinder and knowing the exact distance to the flag or target takes the guess work out of which club to use. It settles your thoughts and lets you focus on making a good swing. My course is not marked very well and the greens are very large. Knowing the correct yardage to the pin will help me hit the ball closer, which would lead to an increase in birdie opportunites and decrease 3 putts. I’m sure the Bushnell Z6 Rangefinder will help me lower my score by providing me the correct yardage. Being able to laser any and everything in my sight would help me know which club to use, and which clubs NOT to use when navigating around holes. I recently purchased some new irons and am trying to nail down my distances with each. I have to drive over 20 minutes to the closest driving range with rangefinders to see how far I’m hitting the ball. I would love to have a rangefinder of my own to take to a closer driving range, save some gas, and nail down my distances! I posted earlier but i didnt include my forum name….. This would be a huge improvement to my game. Many of the courses around here have had the yardage markers in the fairways taken down and you are left to try and find a stripe painted on the cart part. Its basically a guessing game. Plus I have gone through a complete bag overhaul and with different irons and balls I am finding my distances to be alot different then I was use too. Having the correct yardage would be huge and I would love to be able to have that at my finger tips. I am absolutely terrible at judging distance. A good range finder would definitely help me shave a few strokes off the old scorecard by simply knowing the proper club to use. Thanks, Luke. A good laser rangefinder would take the guesswork out of judging distances and allow me to concentrate on executing the shot. It would also help during practice to get the club distances dialed in so you know exactly how far you hit each club. The Z6 will help my game by letting me know exactly what yardages i have to each spot on the green, fairway, or whatever else my target could be. instead of having to depend on the possibly-faulty markers or scorecard, i will always know exactly what the number is and what club to grab, making my journy to a lower handicap that much easier. Would love to get me one of these. My eyes are dim. Have never used a Rangefinder and now would be the perfect time – my course has a great driving range but no distance markers! Tuning my clubs to more precise distances would really help my scoring also. Well I have a few reasons as to why the Bushnell would make me a better golfer. For one, I am a bit of a range hawk. I have a membership to one that really does not have identifiable yardages from where you are hitting. The Bushnell would help me at the range by telling me how far I am hitting the ball with each club. This would carry over to the course as I would know my yardages better. That would save time in my preshot routine due to me knowing which club to hit. This would save lives as the person behind me would then not want to kill me after the round. So to recap. Having a Bushnell would save my life!! Since I have nothing at this point this would help me out tremendously. I struggle with inaccurate course markers and this would help my gzme a great deal. I have an older first gen laser that is about to die. Getting a chance at the state of the art Bushnell would be awesome! Knowing the correct distance makes a huge diffidence is it a 8 or 9 iron. Having this bushnell device would help my game because not only would I know the exact distance to the pin, but I will also know the exact distance to any target I want. It would make lay ups easier and assist in which club I hit off the tee. Plus the batter indicator would let me know when I need to replace so I don’t have that “oh crap” moment on the course. With this Bushnell device, I can finally be confident on my distances. Ive never had confidence in how far each iron, fairway wood or hybrid travels. The confidence boost alone would improve my game dramatically! I have always been a little off on my yardages and have always thought it would be nice to have a range finder. I hear the Bushnells are awesome but I have limited funds for golf. I have a newborn and it’s hard enough to cover some of my greens fees. It would be so awesome to win!!!!!! Sure could use some help with distance info. I had eye surgery on my right eye and depth perception is very messed up. This could really help.